I came from Flash, I'm a graphic person by nature, where is this in QC's world? The nodebox project is reasonably mature and creating _really _high _quality _work and is open source. Is it sane to join the dots here? They might well be interested too. Their stuff looks really good. yeah... initially a wrapper rather than native nodeset? it would be interesting to evaluate what the options are for 2D work, and the feasibilities of them. at the basic end i guess you have a simple 2Dtools set of nodes, then you have something like a SVGtools set of nodes that deal with importing, modifying and displaying the SVG format, then you have something crazy like a wrapper for nodebox code, with its fanciness such as importing illustrator files. need to include an r-project.org wrapper too, while we're at it. No, at Yon Reptile Campaign we've actually been using RLIB, not r-project (confusingly similar). But r-project looks pretty useful too. Smorkis and cwright : you are brillant ! ok, so I was talking to stefan of neongolden earlier today, and he dropped some links to some more nodebox internals. About a month or two ago, I was talking to Yanomano about programmable patches (there's probably a topic around here somewhere on that). These are very complex in QC, so we'd probably make a very limited programmable patch at first, until we know what we're doing. Being slow sometimes, I've just now connected the dots: An embedded python path with OpenGL, NodeBox, and other bindings (maybe opencv? these aren't stable from my experience..). We'll have to have a red patch (for ogl stuff) and a blue/green patch (for generative image/value stuff). Is this sane? or is this the stupidest idea ever? This isn't even touching Nodebox yet (that should be simple once I figure out what I'm doing). Kineme secretly developed a brain controller, and now they can tele-drive half of indian devs to code QC plugs. Images are another matter... I can do input images for use with GL (I'll just load the image as normal before entering the python code, so it's all ready to go), but output images appear to be more difficult. I just want to stick up for Python. I've been using it for many years and I really love it. Earlier you mention that Python doesn't have enough introspection to do dynamic stuff. This is absolutely not true. I'd be happy to work with you to help you get this working. Also I'm not sure why you think you need stackless. There are many reasonable ways to keep one stopped task from impeding others without using stackless. Please don't give up on Python. As I said I'd be happy to do what I can to help you with any problems you run into. Thank you amos :) I have no doubt that it's good (there's a considerable amount of well-written software that uses it, and it's simple to whip up not-so-well-written proof-of-concept stuff with it as well). It's not my intention to start a flamewar or badmouth python. However, putting stuff into QC does stress the design of many libraries (only OpenGL has held up without issue. OpenCV has quite a list of 'hates' after fitting the half-dozen functions into QC, and that's the simple stuff). I may be using "introspection" in a way different from most programmers: I have a PyCodeObject (in C), I want to get the number of functions, their names, and their parameter count. Bonus points if it's possible to tell if a parameter is a number rather than a string. All sources I have indicate that this is Not Possible without considerable hacking. Unfortunately, this is necessary for the patch to create input ports that drive Python functions. (without using the dynamic code hack I mentioned). How does one keep a stopped task from halting the interpreter? If I do a "x = 1 + X", and X is undefined, it parses and compiles just fine, but executing it causes all subsequent calls to PyEval_EvalCodeEx to do nothing. clearing the error doesn't seem to correct it, so the next best thing is to close the (global!) interpreter, create a new one, and tell all the other Python patches to recompile (since their compiled objects are invalidated when the first interpreter was closed). Stackless solves this "The Correct Way" in my opinion: independent interpreters rather than a single global one, so only the crashed interpreter needs to get restarted, all the others don't care. Threads are not a solution to this problem since QC is serially executed. If there's a way to do this without using stackless, I'd love to do that (mostly because stackless will make the plugin an additional 10MB, compared to its current few hundred KB). I'm sure many of these issues are simply because I don't know Python all that well yet. Please e-mail me and we'll discuss this more. I'm quite interested to know what provisions I should make to help native python developers enjoy the environment, and work around these basic interface issues. A python patch would be excellent. Especially combined with opengl! I don't know how this would work with QC though, and how the output would be mixed in, but I guess it should be possible. I've not used nodebox, so I can't really comment on that. As strange as it sounds, I think the way iterators work currently is "the right way" for them to work. Analyzing patch code live to cut out redundant GL state transitions is Impossibly difficult to do (in fact, it might be impossible period; the Halting Problem and all). A faster "Right Way" that I've been thinking about is something a cross between QC's structures and VVVV's "spreads" (arrays). If the GLTools patches are modified to accept structure inputs, they can skip the redundancy themselves and draw multiple objects. This could also be the case for Kineme3D (structure of objects). I you can put this principe to modify strutures on the fly it could be awsome ! Imagine a structure with : position, rotation, scale ,argb color, etc...members. yanomano: that's exactly how my scroller composition works, using iterator, so things like this are already possible. You just animate the object using an LFO connected to the x/y/whatever input, and use iterator variables to modify the phase of the LFO. That offsets each letter. 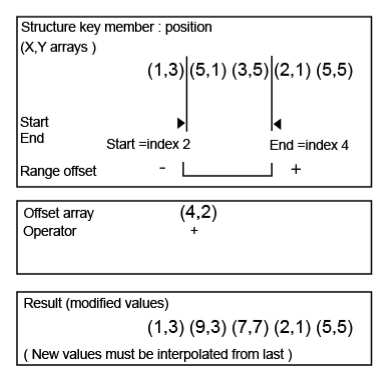 It's possible to use count or whatever else too, and just offset with a math patch. Animating the offset is easy once you do that. Modifying structures on the fly is probably possible using queue and a feedback loop too, although I've not tried it. I have noticed that once a queue is full, it shifts it's contents to make space for the next entry, so you could (ab)use that to make an alternative to iterator with a bit of thinking. GLTools that accepts structures would definitely be great, but it instantly made me think that a structure of structures is necessary (say for groups of custom objects). I'd guess it's already there, but I've not had reason to test it yet, so anyone know if it works? this looks like an interesting app, but since it's an application (not a library), it would be a bit trickier to embed into qc. Some more 'idea material', more visual programming based like QC, but both adaptable for programmable style generation too. Werkkzeug, again. This is the texture generator from v3 (which isn't released other than the texture generator). This is amazingly powerful, and all built from small steps. It's also windows only unfortunately. It's what they did the textures for kkrieger (the 96k game) and debris (the 170k demo) with, both available here (both well worth watching if you have windows and have any interest in graphics + programming). Toolbox, a mac app that works similarly to werkzeug TE, but in a more apple kind of way, and I guess using CI stuff. Polygon editor - this looks great. You build up a chain of processors much like qc, then draw in the editor, it generates the polygons and shows it with the applied processing in realtime. Supershapes - this would also be VERY handy in QC. These looks like they'd be way handy for geometry generation in QC (more kineme3d ideas, heh heh). It's difficult to tell where polys begin and textures end though. All of those could be just textures with nice filters to give them apparent depth. Neoneye finished up a new public release of toolbox, including lots of vector stuff. I'm too busy getting my demo finished off to play with it, but from the videos + screenshots i've seen it looks brilliant - you hand-draw vectors, and then you can smooth, quantize etc., and apply loads of filters QC style. I have been playing around with NodeBox for awhile and loading that stuff into qc, so this would be amazing. Hi together, just wanted to let you know that there is now a branch of nodebox around which has already Open-GL-Bindings and renders in an Open-GL-Context. Maybe thats even easier to connect. Is basicly a command-line version with a small framework code. 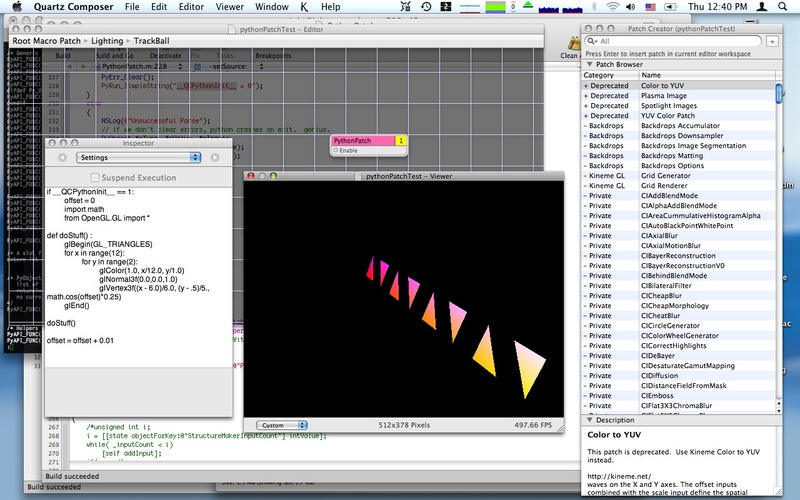 NodeBox is a framework that lets you create interactive 2D visuals using OpenGL. Documentation is still a bit lacking, but you can run python generate_epydoc.py to generate API documentation (using Epydoc: http://epydoc.sourceforge.net/). 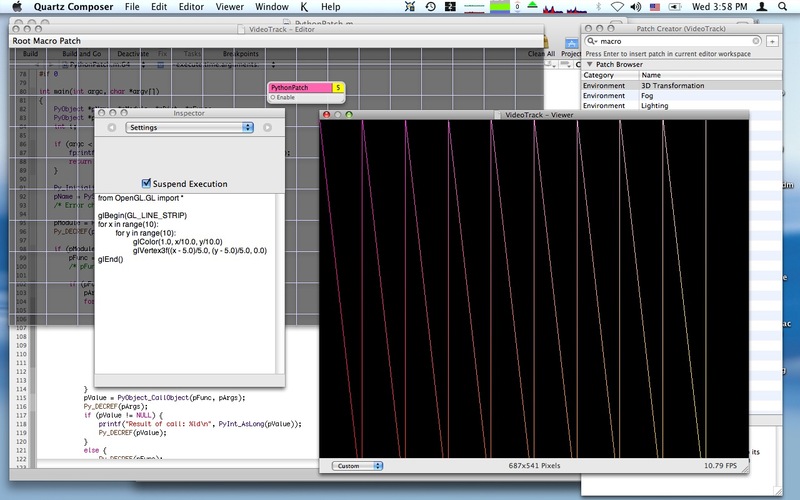 All the bezier math is included. There is text support as well, as well as an offscreen renderer and the start of some shaders (blur, colorize, gradient). There are also some powerful classes that are not in NodeBox: - Transition: for motion tweening - Layer: variable origin point, tweened group of shapes - Animation: slideshow of images. There is no documentation, so you will have to dig into the source. If you fix bugs along the way, please keep a list of where you found them, as there is no version control yet. Importing libraries may or may not work out of the box, I haven't tested it yet. python in QC doesn't work so well (this has been discussed into the ground -- no execution context etc).